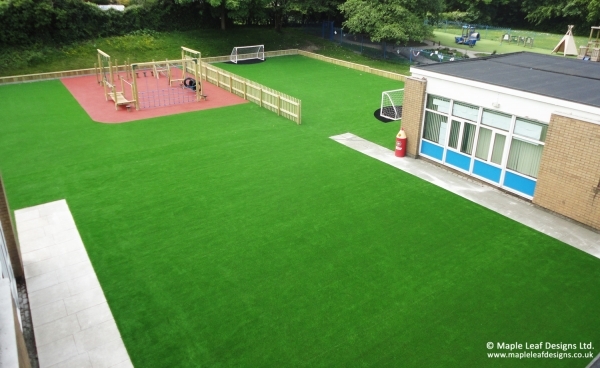 Our artificial grass surfacing is ideal for any nursery, infant or junior playground environment it can be laid straight over your existing tarmac, wetpour or flagged playground to brighten and freshen up the area. We also install it on to grass with a suitable base making a great virtually maintenance free area. We have 20mm, 25mm and 40mm pile height artificial grass all of which are very dense and therefore require no costly sand infill like other artificial grasses available. We also offer various coloured artificial grasses (white, black, yellow, blue, purple, red, orange) that are perfect for creating bespoke colourful play areas. Please see the pictures showing examples of artificial grass areas that we have laid in playgrounds, MUGA ball play cages and other outdoor areas.